Once upon a time, I could never imagine myself eating fish head and I also couldn't understand back then the passion some of the connoisseur have for fish. However, many years later, I then realised having tried it myself, fish head could be absolutely sumptuous if prepared right. Now, I especially adore steamed fish for its freshness and abundance collagen. This unassuming stall to be reviewed today is a typical cze char stall just like many others in Singapore and is the corner stall facing the road. Their signature dish is purportedly, the steamed fish head. There are a variety of fish head used for this dish including red garoupa, carp etc. Our favorite is the big head grass carp 松鱼 which is a freshwater fish. Normally, freshwater fish is acquainted with mud-taste when cooked but the owner skilfully rid off the "muddy" taste. I think, in steaming a fish head, the timing is real important as it will determine the meat quality; i.e. its tenderness and succulence. 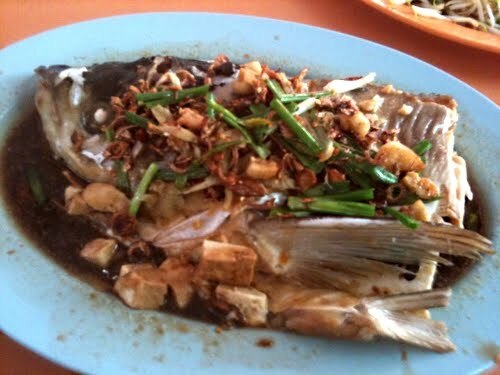 With this stall, the fish head is indeed succulent, fresh and tender. Not to forget, near the gills and around the eyes are filled with gelatin! Yummy, as collagen is good for your complexion, I guess. 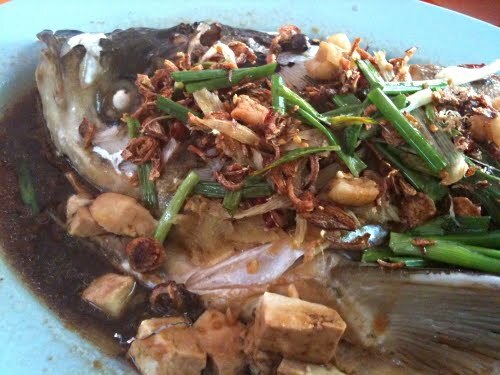 The steamed fish head is garnished with toufu, lard (optional), fried shallots and spring onions. The sauce is nothing more than just soya sauce, perhaps a dash of sesame oil and some seasonings.